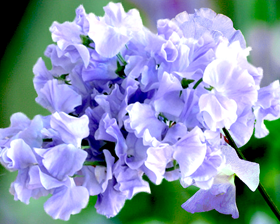 A marvellous variety for either the garden or bouquet, with unusual blooms featuring a gentle blue. The delicious fragrance and strong performance make this sweet pea a must for every garden. Prefers a well-drained soil, in full sun. Sow October to January indoors, or March to April outdoors. Sow 1cm deep in free draining, damp seed compost. Place in a propagator or seal container inside a polythene bag and place at 20-25C until germination which takes 7 to 21 days. Spring sowings can be sown outdoors, 2.5cm deep, in drills 7.5cm apart.